The dad joke is a delicate thing. Part knowing humor, part lack of humor, it's only requirement is that it elicits not a laugh from its audience but the annoyed response: "Daaaaaaaaad." Bad Dad Jokes is the biggest, baddest collection of "so bad they're actually good" jokes that are guaranteed to deliver a daily dose of groans and giggles. 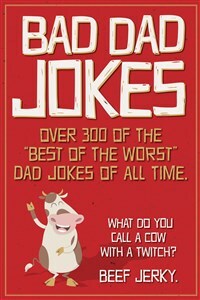 Bad Dad Jokes is a one of a kind collection of extraordinary humor in one book. By giving this collection as a gift you will bring humor and lasting memories to events for years to come.